How to Recover a Floating License? My LP360 license is in use by a process that is no longer active. For instance, my machine shutdown unexpectedly and left my LP360 license locked. The license will recover itself after a short period of time. Take a brief pause and try again in a few minutes. 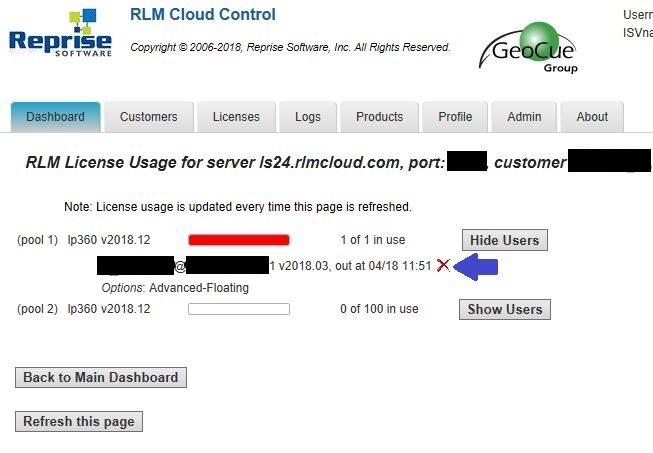 Have your LP360 License Administrator log into the Client Portal, https://ls24.rlmcloud.com/rlmcloud or https://ls41.rlmcloud.com/rlmcloud, depending on the IP address in your license string. 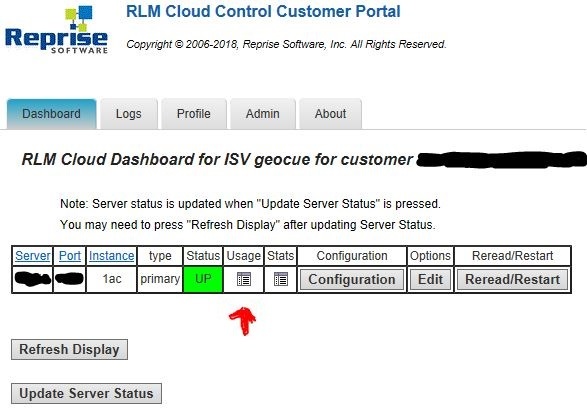 On the Dashboard tab, click on the icon in the Usage column. Then click Show Users beside the license in use to see the users and machines on which the licenses are checked out. Click on the red X to attempt a recovery of the license. Format is <username>@<machinename> 1 <LP360 Version>, out at month/year hour:minutes in US Central Time. On the confirmation page, “Remove lp360 license from user <username> on host <machinename> – Are you sure?”, select “Yes – Remove License”. Note: If the license is roamed, you may not recover it. This entry was posted in AirGon Installation, Licensing and Updates, LP360 Installation, Licensing and Updates and tagged free license, RLM, RLM Floating.